Welcome in support section. If you don't know, how to use MozBackup, have a look at instructions which was created by Shazam. You can find some info about MozBackup in Knowledge Base on MozillaZine: MozBackup too. If you need to backup via command line read article how to do it. Some frequently questions are answered bellow. If you still have a problem or question, you can contact me. Is Windows 7 or Windows 64 bit supported? Where is a Linux or Mac OS X version? Where backup's file is located? Is there a way to make MozBackup work with Portable Firefox? Is there a way to make automatic backup? Must I uninstall a previous version of MozBackup before installing a new version? Can I change default backup filename? Can I use MozBackup for synchronization between two PCs? What can I do if I have a problem with restoration of backup? After restoration of my mails I don't see some mails in folders. What can I do? Backup of Thunderbird profile is too big. Any thoughts? MozBackup detects another version of Mozilla application. How to fix it? After restoration all my extensions are disabled. What can I do? Cannot open file signons.sqlite. Access is denied. I got error message "Zip file could not be opened". What's wrong? I got error message "resource missing for 11684". What's wrong? Sorry, no versions for Linux and Mac OS X. I don't have plans for doing these versions. It's a normal ZIP file. You can rename PCV to ZIP and extract files manually too. Default location is folder Documents in Windows profile. You can change this location in program wizard. Yes. 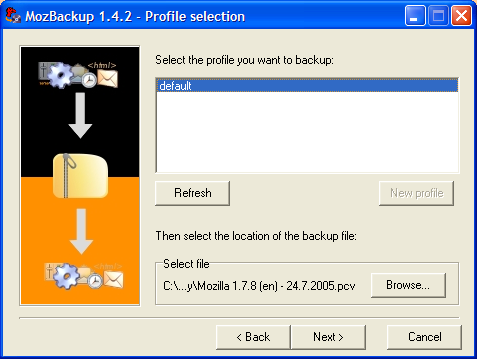 Use MozBackup 1.4.8 or higher. In "Profile Selection" you can choose place where you have your portable profile. Yes. Use MozBackup 1.4.8 or higher. Article about automatic backup. Yes. See config file backup.ini in program folder. I don't think this is a good idea. If you use Firefox try Firefox Sync which is better for such task. If you use Thunderbird try to think about having your mails on server and access to them via IMAP protocol. Familiar solution you can have for contacts. Rename PCV file to ZIP and extract manually. Visit MozillaZine KB where you can find how to do it. After restoration of my mails I don't see some mails in folder. What can I do? Looks like index file for this folder is corrupted. Try to fix it. Use "File -> Compact Folders" in Thunderbird before backup. See Knowledge Base on MozillaZine: Compacting folders. You can ignore this - info about version is only informative. MozBackup gets this information from Windows registry. So if you have old information there, MozBackup shows this. Program backups/restores profiles and for this, it's not important that the version of applications is completely accurate. Close Firefox, go to your profile folder and delete file extensions.rdf. Some program blocks file signons.sqlite where Mozilla application stores password. Have a look at applications which are running. Find application which blocks this file and close this application. This problem is fixed in MozBackup 1.5. It looks like your hard drive contains bad sectors.